I said top 3, ideally KL should open especially with the form he's in but then neither Sharma nor Dhawan would come down the order or will they? Our batting order is anyways messed up, Kohli @4 is only like a band aid for a rotting corpse. I'd be really surprised if we make it past SF with any possible 11, from the current 15, we field out there. Rahul might get the No.4 spot on basis of IPL form as Shankar has batted well below par and Karthik too hasn't been in form. 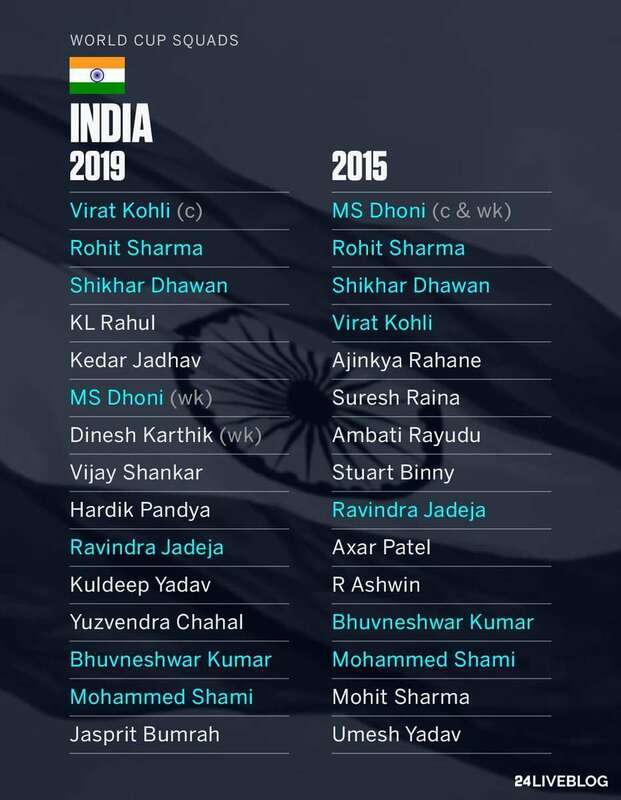 Man to man this squad is better but we also punched above our weight in 2015, I think someone like Nehra in form would've been better than Mohit Sharma. Remember Kohli was out of form & Dhoni was already fading, the biggest problem for us was the fielding restrictions that made the WC a batting shootout on flat pitches! F Q selectors,it was rather on expected lines , msk.and co..the name is enough ,you cant expect them thinking out of the box,that jadeja on featherbeds of Eng ....carnage !brace yourself fans..
Three spinners to England is a strategic blunder. Instead they should have added one more pacer. The 3 spinners in squad hints that 2 spinners will be in playing 11 in most matches. its not for KL , but I feel Virat is actually best suited for No4 . He can win us more games from there . He's there to ensure Dhongi plays every game possible. Called it a while back. Pant vs DK was always going to be a 50-50 call. Think we will see only two specialist pacers + Pandya + 2 spinners as bowiling options. Wow.. 2015 squad had Mohit, Rayudu, Axar, Binny.. How did we even reach semis..? Got it right didnt I ? Just felt though Saini on current form is better match winner . If we lose an early wicket, then Vijay Shanker should come at 3 and Virat at 4. Vijay Shankar is better at playing swinging ball then K L Rahul.